Posted on May 4, 2015	by Katy K.
This is one of the Cybils Teen Speculative Fiction Finalists! I was going to review all four of the remaining ones in one go, as I did the first three, but the library was busy today (yay! Even though the library’s main entrance is closed down and patrons are being re-routed to previously hidden doors) and I guess I have problems being concise. 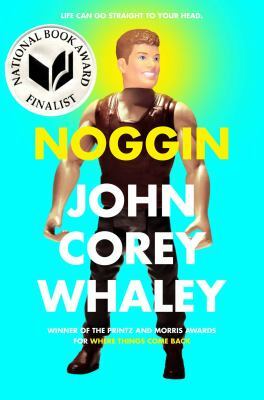 Noggin by John Corey Whaley. Atheneum Books, 2014. I don’t know what it is about me reading books with significant timing – but I ended up reading this book about a young man coming back from the dead five years after he died five years after my younger brother died. Right around the two-year anniversary of his death, I read The Piper’s Son, about a family struggling to recover from a young family member’s death two years earlier. That turned out to be tough but fabulous. This one was maybe just the wrong book for me at this time, and I can’t really get away from that very personal reaction to it. But on to the book. Travis Coates was 16 and dying of cancer when he was offered the chance to have his head cryogenically frozen in the hopes of reviving him at some point in the future when technology was advanced enough to give him a new body. That turned out to be faster than anyone expected – just 5 years in the future. Now he’s back with a taller, buffer body, ready to get back to life – only everything has changed. His friends have graduated from college while he still has to finish high school. His girlfriend is engaged to someone else, and things with his former best friend aren’t much better. Whaley skates the line between serious and funny as Travis tries to make a new life for himself, as well as trying to recover some semblance of the old one. The humor comes partly from the ridiculousness of a star classic video game player now having the body and muscle memory of a skateboarder. As he and the people he love try to adjust, Travis has to ask himself if the price of his coming back wasn’t too high for all concerned. This would be a great book to give to teens who normally read contemporary fiction who are looking for science fiction. The premise is undeniably sci-fi, but the world is still ours and the sci-fi event within the realm of the possible. The writing is zippy and the cover gives a good idea of what the book is about while being appealing. I wasn’t sure that I bought all of the characters: Why is the former girlfriend getting married at 20? Why does Travis pursue her so relentlessly even when she tells him she’s moved on? But this looks at some deep issues and there is a lot to think about and discuss, either in formal book clubs or just with friends. That’s why, even though this didn’t work for me personally, it’s one I’ll keep in mind to recommend to teens at the library. This entry was posted in Books and tagged award winners, Cybils, teen science fiction. Bookmark the permalink.